Sixty images in each deck offering no interpretations, no scholarly dissertations and no pre-fabricated answers to life’s questions, yet SoulCards have inspired the imagination of thousands of people throughout the world. Will McGreal, who first introduced Koff-Chapin’s images to the world, reflects on the “how” and “why” SoulCards work and the fear they refuse to let us negotiate. In his article below, McGreal encourages us to get off the path and say goodbye to a yellow brick road that runs on interminably somewhere other than the Kansas of our daily lives. Planetary synchronicity or something bigger? For all of us who have been on some kind of personal journey, is this time now, as we enter the millennium, any different than similar journeys throughout history? You would think so. It was not too long ago that the first World Peace Event was followed by an equally popular event, the Harmonic Convergence. During that period, everyone I knew was coming out of the closet of New Age business-as-usual and investing most or all of their transformational energy in the mighty promise of such planetary synchronicity. For a while, there was a circus-like atmosphere as person after person admitted that he or she was actually from Jupiter and that the time was coming soon in which all would be revealed. As each event passed and our lives transformed below the predicted quotient, a new convergence would present itself just in time. It’s not that these heavenly moments are devoid of any transformational potency. Who’s to say that we aren’t, in fact, being transformed? We are finally in The Age Of Aquarius, after all. But if there is a shift in consciousness, I sense that it is no longer a shift from who we were to who we want to become, but in how we experience who we are in any given moment. If this is indeed the current shift of consciousness, then it is indeed as significant as anything promised by the Harmonic Convergence. It means that, in our quest for the Self, the Journey’s promise to find the Self is replaced by the immediate and direct experience of the Self. There have been as many different versions of the Journey as there have been people on them. Even if each of us is on his or her own path, the single, most defining characteristic of every Journey is that it takes us to somewhere we are not at present. The Journey begins with our discontent or our restlessness and leads us to a future moment in time and space in which we will be different than who and what we are now. Who has not thirsted for the waters of a different happiness? Who has not hungered for the bread of a better life? We will go to great lengths and often make considerable sacrifices all in the hope of being delivered by the Journey to a place and time in which we are satisfied and satiated. Yet this is the tragic flaw of the Journey: it can never make good on its promise. So long as we believe that what we seek is someone or somewhere other than who or where we are now, the Journey cannot deliver to us our Self. It can never be “us” at the Journey’s end if we are looking for a different, improved “us” at the onset. It is our Self with which we are intimately discontent. It is this current experience of the Self that compelled us to leave this moment in search of the next. The phenomenon of seeking an improved self has its resonance in many, if not most, of the tools we may employ along our Journey. Flip a card, select a stone, cast three coins, name your birth date and time and then either crack open a book of someone else’s interpretations or make appointments with people who have studied the secret manuals or possess some strange gift making them uniquely qualified to invoke the power of these divination tools. The information may be profound, amazingly on target and even useful but that is not the point. We have once again reinforced the notion that what we seek is to be found outside the domain of our own Self. Even if we then claim it as our own, something more potent and wiser was required to begin to awaken our self-awareness. For years, I gave thousands of readings with the Tarot laid out between myself and the client. Sitting above the images, trying to peer down into the hidden meaning of each card, my clients behaved as tourists on a glass bottom boat. Appropriately, I behaved as their tour guide. Of course, I knew the meaning of each card. I studied them with enthusiasm and appreciation. Embedded in the Tarot were archetypal constructs on which hung tried and true symbols. A lucid language of the mind coming close to describing the indescribable and giving shape to the unseen. With practice, the Tarot offered clarity and precision in an otherwise confusing and unpredictable domain. My previous career as an orchestral conductor, where a similar relationship exists between the music and the score, made the Tarot initially attractive and very useful. But like my glass-bottom boat tourists who would hire me to interpret the wonders of the mystical sea of Tarot, I remained in the boat with them, so to speak. Although I was to be the expert, the one who had ventured down into the depths of the unknown, our relationship ran the danger of taking place completely above the surface in the safety and convenience of our little boat which we call a reading. From our shared position, I knew that no matter what I said-whether I was believed or doubted, whether it was phenomenal or mundane-remained on this side of transformation. At best, such information could only encourage the client to continue on his or her Journey of longing for a different Self. I found this ineffectual and debilitating. In spite of the fact that I avoided delivering information in a gypsy-like character, their tourist attitude translated everything into a “we’ll see” kind of reading. What I needed was to work in such a way that each person would feel whatever he or she was looking for as already within. This was accepted in theory by almost everyone but, in practice, the mind that was on the Journey could not be the mind that experienced the transformed Self. I could not get either of us out of the boat and into the sea. It was about this time that everyone on a Journey was beginning to have a Ruby Slipper experience. The gentle persistence of Joseph Campbell’s message, books like Cameron’s The Artist’s Way, as well as the engaging dance workshops of Gabrielle Roth were among the signposts directing us off the Yellow-Brick-Road to the power we possessed all the while. For even while Dorothy and company may have learned a great deal from the Journey to Oz and the Wicked Witch’s castle, in the end, Dorothy could only go home by invoking her own power which had been with her every step of that road. Dancing to the rhythm in your own soul, following your bliss, experiencing the world as a creative artist are all invoking the mystical properties of experience that exist within us in every moment and at every step of the Journey. And it was about this same time that I gave away my Tarot decks, vowing never to do readings again. On that very day, I met Deborah Koff-Chapin and was handed a set of photographs of uniquely familiar paintings. I had never seen them before but each one stirred up a deep emotional resonance. I felt as if I was looking at my own soul. I spent what seemed forever flipping through each photo. This one a face emerging out of the earth and beneath it the eyes of my true self and I know it is a power deep within in me coming to the surface. Here a profile letting fall from its lips a dove and it is the peace and grace that sometimes fills my thoughts and it is the same dove that is likewise outlined in the profile’s head. Another painting. A striking one. A figure suspended in a universe of emotion. It’s me and I am frightened of losing who I think I have been all my life. I stare at this one longer and the figure’s body is dissipating and I am so afraid and shield what remains of my familiar body against the inevitable change. “I want to use these to do readings,” I told her. I did. In fact, about twelve hundred that year before they were finally published as SoulCards. I was pleased to find that I was not alone in registering strong and immediate responses to the images. “That’s exactly how I feel,” many would say during a reading after seeing a card. Often people would flip a card and launch into their own insight and describe how it so perfectly applied to their life. And every time I reported such things back to Koff-Chapin, it confirmed what she suspected and intended for SoulCards: that people could use them on their own and deepen the experience of the Self. Unlike their Tarot cousins, the subject matter of each SoulCard painting was not placed according to a strategy or system. There are no symbols included by design or structural intent. There isn’t even an order to the sixty cards. Most unusual, there is no reference manual offering specific interpretations for each image. The only way for SoulCards to work is the way in which they work automatically; with SoulCards you are left to interpret an image according to the response it evokes. And evoke it does, practically without exception. Even the most skeptical, I-want-you-to-tell-me-what-my-future-is client can not escape the gripping sensuality and authentic presence of the paintings. A recent example is a young man who could not bear to hear that his child-like creativity was his passageway home amidst his self-critical, fearful attempt at being an adult. After repeated protestations sounded in a poignant, anguished voice, he rose to leave but asked about one of the SoulCards still face up on the table. He couldn’t stop looking at it, now in his hands. I offered a skeleton of an interpretation which he interrupted, saying, “Making something in me real, huh? It means that?” I reminded him they have no specific meaning. He continued allowing his communion with the image to evolve in silence. His own relationship to the image was more revealing and informative than his relationship to my interpretations. I let him take the card with him. He was delighted and grateful. Even as he left the room, his attention remained attached to the SoulCards image in his hand rather than the ritual of closure. I believe SoulCards’ power lies in the manner in which the images were created. 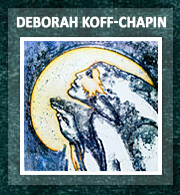 Koff-Chapin discovered through what she calls “revelatory play” a simple but profound drawing technique. Ink is rolled onto a smooth surface and a paper is laid over the ink. Moving the hands across the surface lifts the ink onto the paper. Peel the paper and there’s the image. Because the whole body is free to participate in the large and small motions of the hands and because many images are created in succession, there emerges an uninhibited expression so articulate that its images reveal the voice of the soul. For artists and non-artists alike, the result is the same-the experience of the Self. 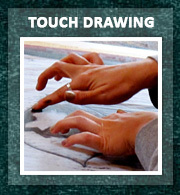 Koff-Chapin’s method is appropriately called Touch Drawing. And it is this magical expression of the soul that lives and breathes within the organic images of each SoulCard. 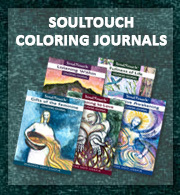 After discovering SoulCards I recognized that I had been on a Journey just like my clients. 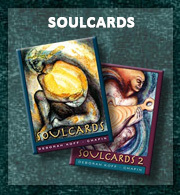 In SoulCards I found what I been looking for on behalf of my clients. In SoulCards I left the Journey and found myself. No longer the tourist or the guide, I was dancing inside the inextinguishable rhythm of experience. My own discovery was mirrored a hundred times over as my clients had their own experience of Self. Mirrored again as hundreds and hundreds spiral into the unknown in dance workshops or brush their souls on the canvas of each moment. And if experiencing the Self firsthand can occur even when the stars are not aligned in unprecedented configurations, the Age of Aquarius may still usher in a new era and new perspective-that global transformation does not require that we transform all together, all at once. For as any one who has truly followed his or her bliss will tell you, transform the Self and the whole universe is transformed.